A landfill is a large area of land or an excavated site that is designed and built to receive wastes. There were 3,536 active municipal landfills in the United States in 1995 according to the U.S. Environmental Protection Agency (EPA). Today, about 55 percent of America's trash (more than 220 million tons annually) is disposed of in landfills. Municipal solid-waste landfills (MSWLFs) accept only household, commercial, and nonhazardous industrial waste. Hazardous waste generated by industrial sources must be disposed of in special landfills that have even stricter controls than MSWLFs. In the past, garbage was collected in open dumps. Most of these small and unsanitary dumps have been replaced by large, modern facilities that are designed, operated, and monitored according to strict federal and state regulations. These facilities may be distant from urban centers, requiring the large-scale transport of waste. About 2,300 municipal solid waste landfills were operating in the United States in 2000.
about the benefits of recovering and burning methane as an energy source. By 2002 the program had helped develop 220 projects that convert landfill gas to energy. Such projects, when analyzed in 2001, offset the release of carbon dioxide from conventional energy sources by an amount equivalent to removing 11.7 million cars from the road for one year. Fresh Kills Landfill in Staten Island, the largest landfill in the United States, accepting approximately 27,000 tons of garbage a day in the late 1980s, closed in March 2001. Although landfills occupy only a small percentage of the total land in the United States, public concern over possible ground water contamination as well as odor from landfills makes finding new sites difficult. SEE ALSO S OLID W ASTE ; W ASTE , T RANSPORTATION OF . 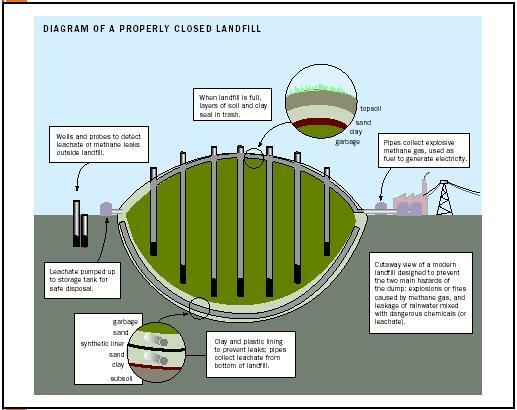 Freudenrich, Craig C. "How Landfills Work." Available from http://www.howstuffworks.com/landfill.htm . U.S. Environmental Protection Agency Office of Solid Waste Web site. Available from http://www.epa.gov/epaoswer .